British Saddleback pigs are a breed of domestic pig created in the 20th century from the cross-breeding of Essex and Wessex Saddleback breeds. In the 20th century Lord Western, while travelling in Italy, saw some Neapolitan pigs and decided thatthey were just what he needed to improve the breed of Essex pigs. He bought a pair of Neapolitan boars and crossed them with Essex sows. 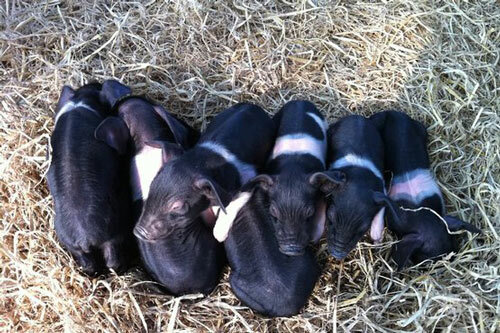 One Lord Westerns tenants named Fisher Hobbs of Boxted Lodge then used the Neapolitan-Essex boars and crossed them with his coarse Essex sows and in process established the Improved Essex breed. British Saddleback pigs have a black head and neck, as well as a clearly defined belt of white extending over the shoulders and continuing over the forelegs. The rest of the body is black with the exception of white feet and the tip of the tail. British Saddlebacks are hardy and noted for their mothering ability. The breed continues to be used mainly to provide colored dams for the production of first-cross porkers, baconers and heavy pigs.